Some models take years to build a following and to perfect their signature style… but Paul The Anti Social Corgi? Let’s just say he’s a natural (with some help from his mom, of course). With fans worldwide, Paul has become Instagram famous for his pink aesthetic, artfully staged photos, and generally amazing, floofy look. We chatted with Cynthia Yeung, Paul’s mom—and one of the designers at Ollie—about the pup’s modeling career, tips for taking Insta-worthy photos, and how Paul The Anti-Social Corgi got his unique nickname. Ollie: What made you decide to adopt Paul? Where did you adopt him from? Cynthia: I actually never planned on owning a dog at all since I live in New York City and figured I wouldn’t have any time. Paul was my brother’s dog originally back in California (he hada previous owner). He didn’t have the time to take care of him anymore because of school and was going to give him up to a coworker until our family had this very impulsive thought to have me look after him until my brother graduated. However, I completely fell in love with him and my brother reluctantly admitted that Paul needed a forever home.It just felt right. Ollie: What was his personality like when you first met? Did you two hit it off from the beginning? Cynthia: Paul’s always LOVED to play fetch--he’d much rather play with you than be pet or snuggle so whenever you would try to pet him, he’d dodge you and give you a toy to throw instead. Although he was always playful from the beginning, it took some time for him to actually seek out snuggles and pets from me. Ollie: How did Paul get his nickname, the Anti Social Corgi? Cynthia: Paul hates other dogs! According to his previous owners, he’s never ever gotten along with other dogs and would much rather play with people. I still don’t really know the source of it, but he used to have extremely bad leash aggression which was very stressful for me and anyone who tried to walk him. I’ve been training him for a few months now and he’s been so much better! Still won’t play with dogs, though. Ollie: Tell us a bit more about Paul's Instagram "modeling career." When did it start to really take off? Cynthia: I never planned on making an Instagram for Paul. I’m a graphic designer by trade and I do photography as a side passion so my friends twisted my arm into starting one! They were like, “Just hold onto the handle in case inspiration hits!" We actually brainstormed a couple names, “BetterCallPaul” was a clear favorite, but it was already taken! Originally it was just typical photos of him being cute, but then gradually, my own design style and art direction started to weave its way into the photos and when I started incorporating pink, I started thinking more about creative ways to photograph my dog, which usually are very random, silly ideas that I would think are funny but no one else would. Good thing Paul doesn’t judge me for them. Ollie: Paul sure knows how to strike a pose! Any tips on how to get your dog to pose for the camera like Paul? Cynthia: I think he’s just a natural! He’s so good at taking direction, sitting and posing, and he’s just so darn handsome. One tip I would suggest is whether your dog is treat or toy driven, just put it on your head so it looks like they look straight into camera. Ollie: All of Paul's photos are so polished, he makes it look easy! But, let's be real: has there ever been a photoshoot that didn't go quite as planned? Cynthia: For sure. There’s been a lot of concepts I had that because of lack of space, proper equipment, or production knowledge, I couldn’t pull off! Those ideas are shelved until I can figure out how to execute. However, these restrictions actually end up driving the direction for a lot of my photos. We just learned to create based off of our surroundings! It’s usually never Paul’s fault, he’s the perfect model. Ollie: How did Paul take the fame of being featured on People.com? Did he let it get to his head? Cynthia: He’s been spoiled since the day I got him, so he already thinks he’s a prince. Nothing’s changed. Ollie: Where did the pink obsession come from? Cynthia: It came from me—as my own obsession with pink grew (like my pink hair), so did Paul’s on Instagram! You can see from our old photos that there was no pink. Ollie: What does Paul like to do when he's not takin' pics for the gram? Cynthia: BALL, BALL, BALL. If Paul could play fetch all day every day, he’d do it until his little legs gave out. He does this little dance whenever he plays because he can’t contain his excitement, it’s super cute. 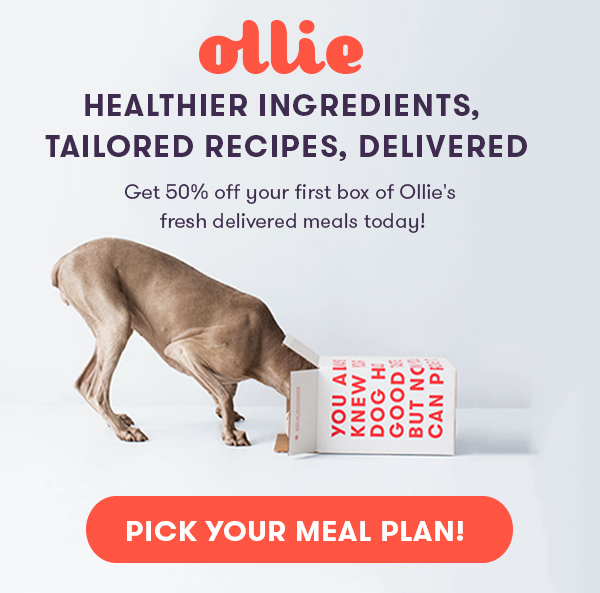 Ollie: Paul's got great pup style—where are his favorite places to shop? Cynthia: He likes minimal but trendy so brands like Prunkhund—their collars and leashes are super beautiful with these copper finishes, Barc London—really clean and minimal leather leashes and collars, and Pawmain-they have dog version of Hypebeast trends, great quality too. Ollie: What has his reaction to Ollie been? Do you have any special feeding rituals? Cynthia: He LOVES Ollie, he used to do the cutest little dance when I put his food down. But I started training him to sit in place before I release him. I also like to put a ton of extra stuff in his food on occasion, like Kin+Kind Blueberry supplement, Golden Paste, organic eggs, goats milk, organic greek yogurt. We have these beautiful BTW Ceramic dog bowls that we got at DOG & CO.
Ollie: What's your favorite memory with Paul so far? Cynthia: I think my favorite memory of Paul is the first time he started warming up to me and cuddled with me in bed after our first few months together. I don’t think I realized that my love for him could get bigger than it did then, and it’s just been growing more and more.